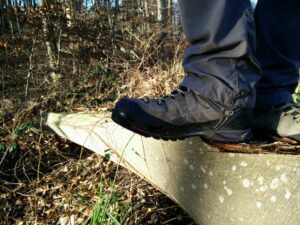 Home » Hiking Tips » Hiking Gear Guide » Hiking Footwear Guide – How to choose the right footwear? Hiking trips will take a toll on your feet and legs as you will often walk on uneven if not rocky terrain. Therefore, you need to wear appropriate hiking footwear which protects your feet from injuries and enhances your performance. As hiking footwear varies greatly in weight, design, support and cushioning, it can seem like bit of a jungle to navigate in for those who are new to hiking. As you might already know, not all types of hiking footwear are appropriate for all types of trails. To minimize the confusion we made this hiking footwear guide which explains the differences between various types of hiking footwear as well as the appropriate use of them. Furthermore, this guide also describes the individual footwear parts and explains how different materials will affect footwear performance. You will also find links to other articles with additional information to complement the overview that this guide should provide. How to choose the right footwear? We can divide hiking footwear into three groups; hiking shoes, lightweight hiking boots and backpacking/mountaineering boots. Below is a short description of each group. Hiking shoes (also referred to as trekking shoes) are low-cut (around the ankle) and thus provide very little ankle support. Therefore, they are not suitable for hiking on rocky terrain or for multiday trips where you might be carrying a heavy backpack. Hiking shoes are normally lighter than other hiking footwear and have softer (more flexible) soles. 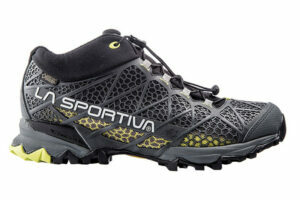 Because of that, they provide good comfort and performance on “easy” trails (dirt tracks, muddy/grassy trails etc.). Lightweight hiking boots (mid-cut or high-cut) provide better ankle support then hiking shoes but not as good as mountaineering/backpacking boots. They are also lighter and less durable (due to the lightweight materials they are made of) then mountaineering and backpacking boots and have softer and more flexible soles – often as flexible as hiking shoes. Due to the lightness, flexible soles and decent ankle support they are perfect for hiking on established trails (dirt tracks and muddy/grassy trails) with light to medium loads (backpacks weighing less than 10 kg). They are, however, not suitable for very rocky and uneven terrain as they don’t offer sufficient support, stability and durability exactly due to the lighter and less rigid materials. 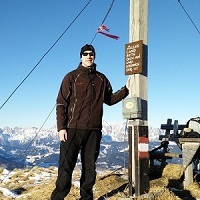 Mountaineering and backpacking boots (mid-cut or high-cut) differ from trekking shoes and lightweight hiking boots by being more robust and stiff in order to provide good stability and support on rocky and uneven terrain – as well as when you are carrying heavy loads (on all kinds of terrain). In such cases (uneven rocky terrain, heavy backpack) more rigid soles also provide better comfort as they don’t flex around every root, stone etc. on the trail. Furthermore, such hiking boots can easily be used with snowshoes or C1 crampons (strap-on bindings). The downside of mountaineering and backpacking boots is that they are less breathable and heavier (due to the more robust materials) than other hiking footwear and thus they are not the best option for day hikes on easy trails. They are in most cases also more expensive than the previous categories. 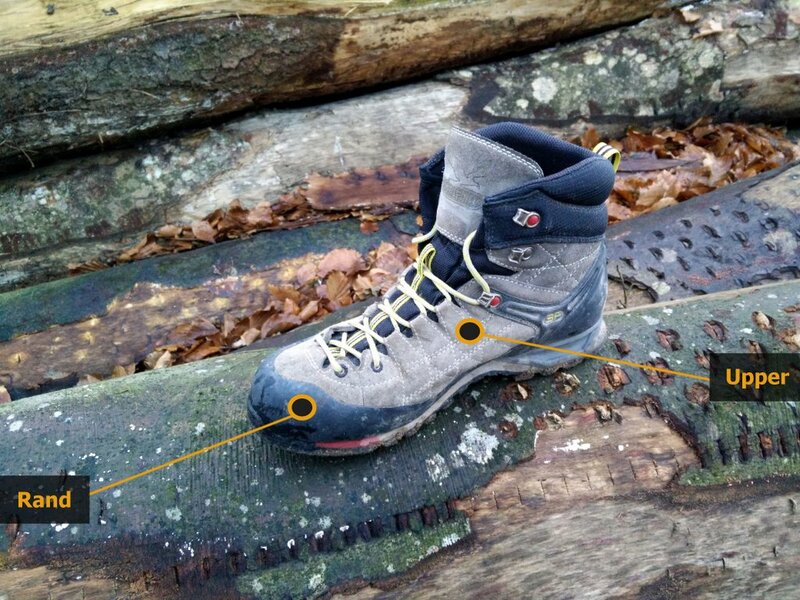 Which parts are hiking boots made of? 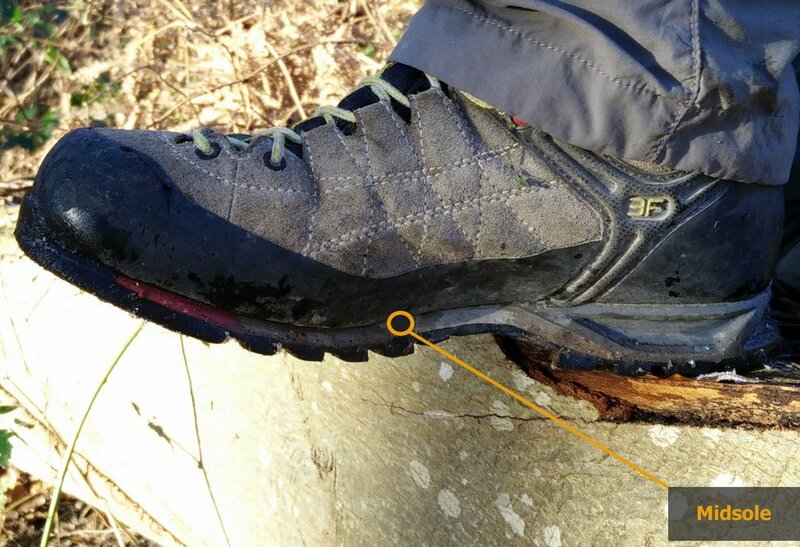 In the following we will describe the individual parts of a hiking boot/shoe and how these parts differ among the three different types of hiking footwear outlined above. 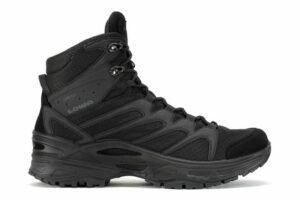 The upper is the upper part of a hiking boot/shoe and provides protection against the surroundings. The upper has to be breathable, durable and water-resistant in order to provide good comfort and performance. Uppers are made of leather (full-grain leather, split-grain leather, nubuck leather etc. ), synthetic materials (Cordura, nylon mesh, polyester etc.) or a combination of leather and synthetic materials (leather is paired with nylon mesh). Some hiking boots also have an all-around rand (usually made of polyurethane) in the lower part for better abrasion-resistance. Each upper material has advantages and shortcomings. Uppers made of full-grain leather are typically used for robust mountaineering and backpacking boots as they are very durable, abrasion-resistant and fairly rigid (providing good ankle support). Very little stitching is required to produce full-grain leather uppers which increases the durability (fewer weak points). Full-grain leather is also water-resistant. However, full-grain leather is less breathable, heavier and more expensive that other upper materials. Split-grain leather refers to hides that have the top-grain removed which makes the leather thinner than full-grain leather. Split-grain leather is normally combined with nylon or polyester mesh and thus shoes/boots with such uppers are fairly light and breathable. However, to combine textile and leather require a lot of stitching which decreases the durability. Split-grain leather + nylon/polyester mesh uppers are normally used for hiking shoes and lightweight hiking boots. Nubuck leather is top-grain leather that is sanded or buffed to have a suede-like surface. Nubuck leather is less expensive, lighter, softer and more breathable than full-grain leather but on the other hand it is also less abrasion- and water-resistant. 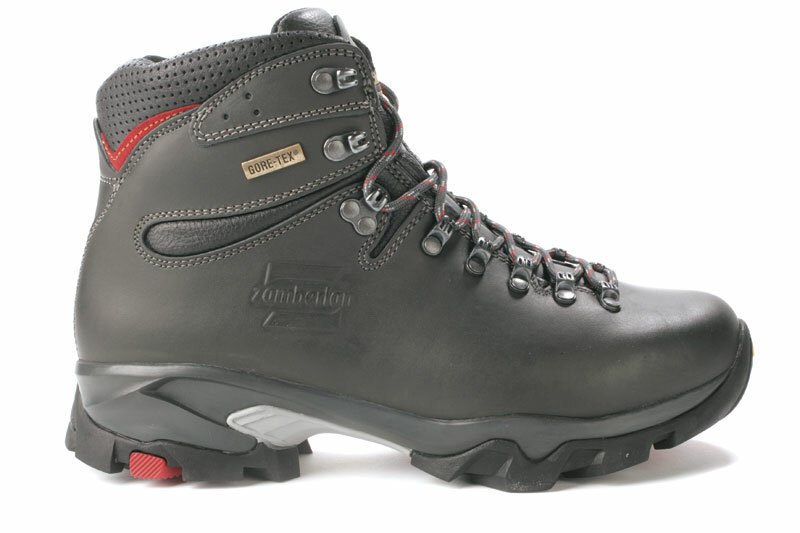 Uppers made of Nubuck leather are used for lighter mountaineering/backpacking boots as well as for rugged lightweight hiking boots and robust trekking shoes. Synthetic uppers normally combine porous nylon mesh with stiffer synthetic materials for increased durability and support. They are lighter and provide better breathability than uppers made of other materials. Furthermore, they also dry faster and are less expensive. However, synthetic uppers are significantly less abrasion-resistant and durable than uppers made of leather. Therefore, they are normally used for trekking shoes and lightweight hiking boots. 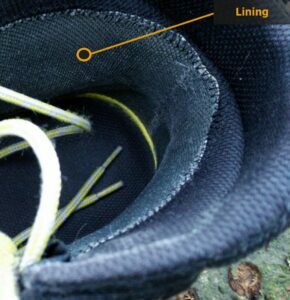 The lining is the material on the inside of a hiking boot/shoe and as it is in direct contact with your sock-clad foot, it is important that it is breathable and moisture-wicking. The lining has to transport moisture from the sock to the outside (where it can evaporate) in order to reduce the conductive heat loss and friction – wet feet get cold very fast and can often get blisters due to the increased friction between the skin and the sock. The upper and lining are usually joined with an adhesive, but it is very important that the adhesive does not reduce the breathability or transportation of moisture. As the lining is constantly exposed to abrasion and friction it is also important that it is made of pilling-resistant material. As nylon has such qualities, it is often used for lining. The lining also provides insulation and water-resistance. Waterproof boots have a lining made of waterproof/breathable materials such as Gore-Tex or eVent. It’s important to note that a waterproof lining reduces the breathability and transportation of moisture to some extent – when it comes to waterproof fabrics there is always a tradeoff between water-resistance and breathability. The more water-resistant the fabric is, the less breathable it will inevitably be. However, by utilizing modern technologies manufacturers can nowadays produce fairly breathable fabrics that offer good water-resistance. It is also important to know that “waterproof” boots are never completely waterproof (if they would be, they wouldn’t provide any breathability and thus let your feet get soaked in their own sweat). Such boots normally keep your feet dry on wet terrain and in rainy weather but you shouldn’t expect that they won’t leak if you step into a stream or a puddle. For general information about waterproof/breathable fabrics check our article Comparison of Shell Materials. Boots that are designed for winter activities normally use insulated lining such as Gore-Tex Insulated Comfort, Primaloft Gold and Thinsulate. An insulated lining features a layer of polyester fleece or synthetic fill for good thermal insulation. For general information about insulation fabrics check our article Comparison of Mid-layer Materials. The tongue and lacing of a hiking boot allow you to adjust the boot for a good fit. The tongue is normally made of highly breathable materials such as nylon mesh (sometimes even on boots that feature leather uppers) and padded to provide good comfort. Like the lining, the tongue has to transport moisture from the sock to the outside where it can evaporate. 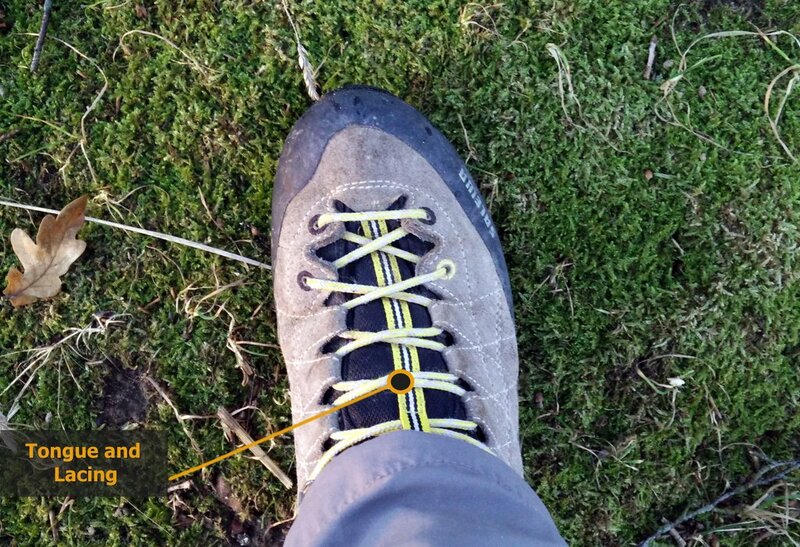 On backpacking and mountaineering boots the tongue is almost always connected to the upper along its sides so that it prevents dirt from entering into the boot. The quality of lacing is of the utmost importance as it keeps the boot on your foot and severe malfunctions can thus make the footwear useless. Therefore, it’s important that your hiking footwear is equipped with durable eyelets/loops that can withstand regular impacts. 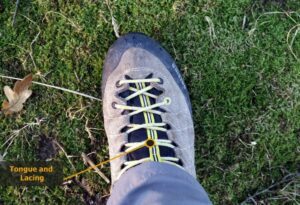 Furthermore, the shoelaces should also provide good durability – some robust hiking boots feature shoelaces with Kevlar fibers for increased strength and durability. The insole (also referred to as the footbed) is the part of a boot/shoe that is directly under the foot. The insole has to be breathable and moisture-wicking so that it can transport moisture away from the sock. Insoles normally also offer some stretch as this reduces blistering on the plantar surface of the foot. Some manufacturers use antimicrobial insoles for prolonged freshness. Insoles are usually removable so that they can be dried faster or replaced after time. 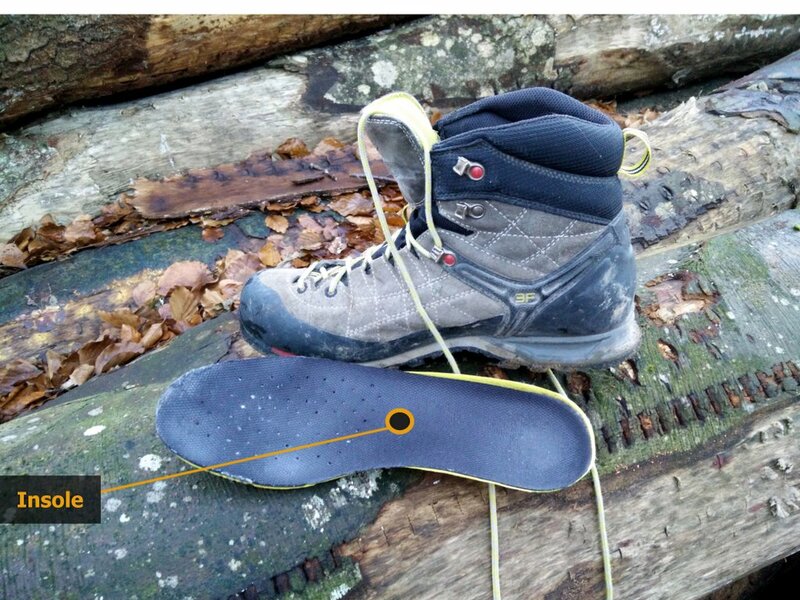 In cold conditions insulated insoles (normally purchased separately) can be used for better thermal efficiency. The midsole is a very important part of any kind of footwear as it is responsible for cushioning, support, rigidity and stability. Midsoles are made of either EVA (ethylene vinyl acetate) or PU (polyurethane). Both materials are foams and thus they provide cushioning as the air get’s squeezed out when pressure is applied to the material – and sucked back in once pressure is removed. EVA and PU differ greatly in characteristics, nonetheless. EVA midsoles are usually lighter and more flexible than the PU midsoles. They are also significantly less expensive. However, EVA has one big downside; in long-term it loses its properties – meaning that the cushioning becomes less and less efficient. Some manufacturers mitigate this problem by adding different polyurethane “structures” to EVA midsoles such as cylinder-like inserts. EVA midsoles are usually used for hiking shoes and lightweight hiking boots; they are very rarely used for heavier hiking footwear (for backpacking, mountaineering etc.) as they are too flexible. PU midsoles, on the other hand, provide much better durability as they lose cushioning a lot slower than EVA midsoles. However, they are also more expensive as well as relatively heavy and rigid. Nevertheless, PU can be adjusted to offer properties (flexibility, lighter weight) similar to EVA without sacrificing its durability and thus PU midsoles are not only used for mountaineering/backpacking boots but also for premium trekking shoes and high-class lightweight hiking boots. The outsole is the part of a hiking boot that touches the ground and is thus responsible for traction. Hiking footwear usually has outsoles made of fairly soft rubber as such outsoles provide good durability and traction on various terrains. Traction is additionally increased with lugs; the deeper and thicker the lugs, the better the traction generally speaking. Widely spaced lugs are recommended for wet conditions (muddy trails) as they prevent mud from gathering in between them. Mountaineering and backpacking boots normally have outsoles with fairly deep lugs while the outsoles of lightweight hiking boots and hiking shoes feature shallower lugs. It’s important to note that lugs increase traction only on soft surfaces (gravel, grass, sand etc.) while on rocky terrain it is the material of the outsoles (rubber) rather than the lugs which provide traction (friction between the rubber and the surface). Does the weight of hiking footwear matter? Generally speaking, heavy footwear increases aerobic demand (heart rate, breathing and calorie consumption) and thus slows you down. In a 1980 experiment experts observed that for each 100 grams added to the shoe, the aerobic demand of running increased for 1% in average. However, it’s important to note that the level of cushioning also affects the aerobic demand; if there is too little cushioning (which would make the footwear lighter) the aerobic demand will increase as the muscles have to absorb higher landing shock. Therefore, we can conclude that weight definitely does matter but that hiking footwear shouldn’t be light on the expense of cushioning. 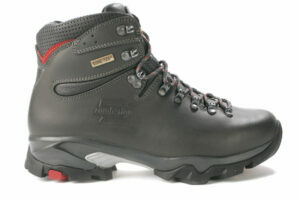 The midsole which provides cushioning is usually one of the heaviest parts of a hiking boot/shoe.